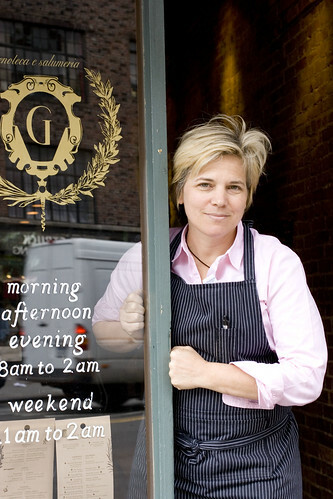 Chef Jody started by showing me her tiny workspace behind the bar. After eating here twice, I had always assumed there was another kitchen somewhere, but there isn’t. There is some more prep space downstairs but no full kitchen. 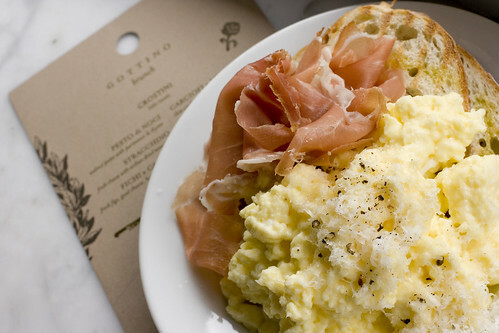 Nearly everything you eat at Gottino 52 Greenwich Avenue, New York, NY 10011 is made right behind the bar. Through adversity, Chef Jody has found a way to work around the limited space and limited appliances, still serving up some of the best stuff in town. She tells me her favorite brunch item is the Crespelle Dolci, the crepes with butter, apples, and walnuts. She uses sea salt from main, Greek olive oil, and feels strongly about very fresh ground pepper. Then there’s this story about how she started making a family meal/staff meal of a waffle sandwich with bacon, egg, and cheese. The idea was something she ate on vacation in Hawaii and it became this secret menu item at Gottino. You won’t see it on the menu, but if you ask for a Surfer Sandwich, they’ll make it for you. The staff I met, Alice Attala, Jeremy Mustakas, Max Poglia, Matt Perkins, and Jenny Robie, seem like family here and makes it feel less like a restaurant and more like a friend’s apartment, only there’s a full fridge with plenty to eat and drink. 1. In a tall porcelain jar (preferably something with a handle), beat together eggs, butter, and salt. 3. Plate the toast. Drizzle with olive oil. 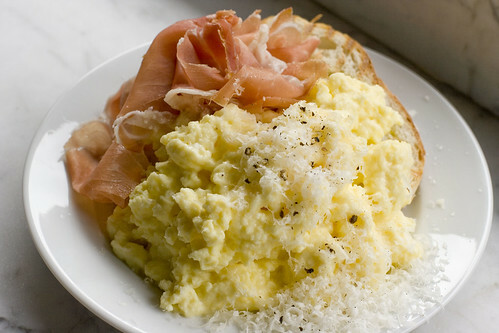 Top with scrambled eggs. Grate parmesan on top, and fresh pepper. Add prosciutto. posted by jessica	at 03:41 PM	Filed under American, Italian, Recipes, Restaurants, Video. You can follow any responses to this entry through the RSS 2.0 feed. Both comments and pings are currently closed. I love everything about this story! I love Chef Jody seeing your post & responding to it. I love her cooking method. I love the video idea. It won’t come up on my page (I just get a box with a small red x) but that may be on our side not yours. Brilliant…now I just need an espresso steamer wand. How awesome! The whole experience is just amazing … and the finished product looks amazing. All those delightful flavors … Mmmm! Kasi, are you able to try from a different computer? Bill and Sarah, I still can’t get over how cool Jody is! Yay Lesley, glad it worked! Lon is working on another way to put up videos but it will take some time to program. For now, I hope this is sufficient. Wow–what a fantastic experience! Lucky you! Lucky you! Congratulations on being able to make these with Chef Jody… The result looks truly amazing! congrats on having this post featured on serious eats! Great Post. I have been steaming eggs for a while now. I think I may have to try the ceramic jar instead of my stainless steel. The butter will now be added from now on. One downside to this method is that the eggs are very watery because of the steam. I usually strain mine before serving. Would love to watch video but it’s not loading in Firefox. Only sound plays. The page won’t load at all in IE. oneeyebri, thanks. =) When I made the eggs with Chef Jody, neither of ours was watery at all. Maybe you need to let it go for a few more seconds, or maybe your steamer lets out more liquid than usual. I haven’t tried it on my wand at home yet and it’s possible her commercial grade steamer is a much better one. Sygzy, trying to find tech support (Lon, the hubby). still didn’t work on the other computer. Using IE. Thanks for the comments everyone, especially sygyzy! Sorry about the video issues, we’re working on a more robust video solution for the future. In the mean time, please do try the link sygyzy provided.. Suggestions: For a home espresso machine, be sure to first spray out the water that collects in the steam tube into a glass or something to prevent it from going into the eggs. Then steam the eggs. Also, I have a teaspoon of a good crème fraîche handy that I dump into the container quickly when the eggs are done and mix through. The eggs continue to cook and this adds a creamy effect. I can add the salt at this time instead of with the eggs initially. Salt changes eggs they say, I don’t really know if it makes a difference in this method or not, but that’s what I do. Larry, I’m sure the creme fraiche is divine! I was always taught not to salt eggs before cooking as well but I haven’t tried it both ways back to back to see if it really makes a difference. Sounds like a good test! How neat! I want an espresso machine! 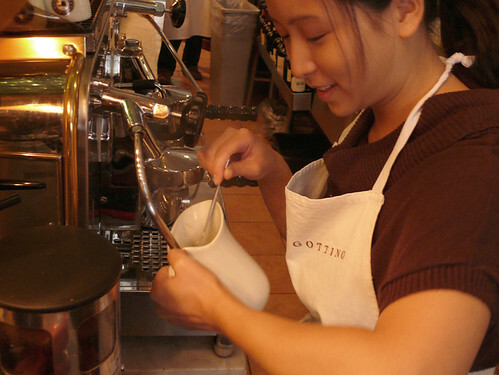 Most home espresso machines use a wet steam compared to a commercial espresso machine that uses a dry steam. That is why your eggs at home will be soggy. you all know the espresso is served with no milk don’t you. an espresso maker will not have any way to steam milk. when you start adding steamed milk it’s latte or cappuccino. Arnold, I think I’m going to have to eat breakfast there more often. That is super awesome you got that experience! Great video and it looks divine! That is amazing! Your video is excellent and very professional looking. It took a little while to load, and did restart twice, but no biggie. Chef Jody is so creative! That is so cool! I would never have thought of doing that, but I bet it makes AMAZING eggs! BTW, your video was very good! Hey girls, Thanks for the video confidence! Lon is working on a better way to load it onto our site. More to come! Feedback? Well, the video is well-done and well-lighted, and the technique is something I’ve never seen befoah. Winner winner. Please, can you find out how they make the wallnut pesto or pesto di noci? Danny, I’ll ask. It’s definitely another one of my favorites there. Larry and Jessica: I’ve never been taught anything about how to cook eggs, but I can tell you that my personal experience with scrambling eggs (the traditional way) is definitely that they don’t come out so well if you add salt before cooking. So my instinct here would be to skip the salt (there’ll be some in the butter anyway) and add to taste afterwards. So, any new about the Gottino’s Pesto di Noci? Hey thanks for this method, I tried it on my home machine (Gaggia Tebe) and it turned out great, not watery at all. Hi Jody i love watchin you on chopped and i am going to you place when i visit my cousin hope to see u hugs from you fan in buffalo Ny .I love french foods . To those of you getting runny eggs – you need to purge any water from the steam wand before beginning, make sure it’s putting out just steam. Also make sure to cook with high steam. The goal here is to cook fast, using lower steam will take longer and allow more moisture to condense. Fantastic! And I love the hand crank slicer! Can you tell me the size of the creamer she uses to make the eggs? I can’t seem to figure it out. Also, what brand she uses if you know.